You know how when we read a dystopian novel, we wonder how the world it’s set in got to be the way it is? Well, this book skillfully shows how this could happens. When computers around the world shut down, no one knows what is happening. At first it seems to be an electrical outage, but it soon turns out to be a viral catastrophe when cell phones are down and anything involving computers does not work, such as cars, planes, and water filtration. 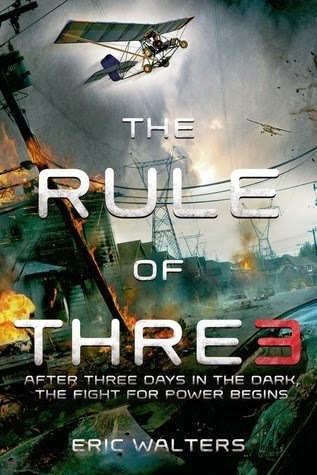 The rule of three states that a person can last 3 minutes without air, 3 days without water, and 3 weeks without food. Sixteen year-old Adam soon learns that to survive, their neighbourhood community must band together for protection because fear and desperation is making people turn on each other with violence, as food resources dwindle and chaos mounts. Walters builds his story and plot well from day one as the reader lives day to day with Adam and his neighbours as the horror and seriousness of their situation becomes more and more apparent. Having a mom who is a police captain, and Herb, the older gentleman next door, who is a retired government spy, puts Adam right in the middle of the action. His skills, intelligence and common sense are key in helping his family and neighbours survive. I really loved the way Walters built suspense and kept me guessing as to how the community was going to survive. Adam and Herb were great characters. I loved their dialogue and their relationship, and how Herb trusts and teaches Adam to use his skills when dealing with people in a crisis. I would almost say this was a psychological YA thriller. I couldn't turn the pages fast enough especially as the danger kept building. The story seems to end a little too abruptly for me. There is not enough denouement after the heart-pounding climax. I think I probably would have appreciated an epilogue in this case. But this is my only complaint really. I thoroughly enjoyed this novel as it was thought-provoking with a unique premise that could become all too real in the world we live in. Note: This book is rated V = scenes of gunshots, killing, explosions. Disclosure: Thanks to Penguin for sending me this book for review. I was not compensated in any other way, nor told how to rate or review this product.